If you are interested by Ultrasound applications using LabVIEW, join the group. The HaroUT™ application presented here is a calculator of ultrasonic delays for phased-array systems. The delays are calculated using ultrasonic ray tracing. 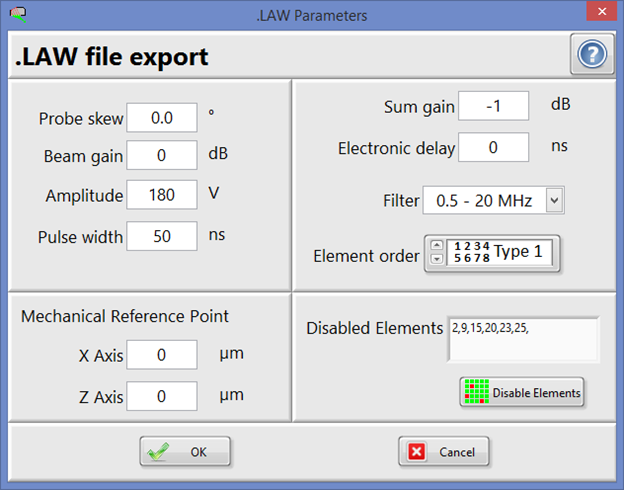 HaroUT can be downloaded for free from the LabVIEW Tool Network. The manual can be downloaded from the current page. HaroUT was developed with the idea to make a tool for calculations of delays for phased-arrays that would have the flexibility and customizability typically associated with LabVIEW™. HaroUT features calculations for 2D arrays, single and dual probes, variable focal laws for linear and refracted scans, and includes 3 part geometries: pipe, plate, and ball. HaroUT currently includes two export formats for the delays: text and .law formats. Other formats can be added by simply copying a plugin in one of the application directories. Contact HaroTek if you are interested by a different export format. The resulting delays have not been tested with actual hardware yet. If anyone has the chance to test the delays calculated by HaroUT on an actual phased-array system, it would be really appreciated if you could provide feedbacks or suggestions. Depending on the feedbacks, future versions of HaroUT might include a plugin approach for part geometries. Another possibility is to develop a library so that delay calculations could be integrated in other LabVIEW applications. Suggestions for other features are welcome. HaroUT was developed using LabVIEW 2015 32bit and requires the corresponding runtime engine. The runtime engine is included with the installer from the LabVIEW Tool Network. Run the installer. By default, the installer suggests to install the application at the root of the Operating System drive. The reason to use this location by default is to be able to later add plugins to the application without requiring administration privileges. A .pdf copy of the in-context help is placed in the <HaroUT>/data directory. The .law export plugin has a separate in-context help with a .pdf copy placed in <HaroUT>\PAUT Export Formats\PAUT info. The left side of the main HaroUT window has 3 tabs: Probe, Focal law, and Sample (see image below). Each of the tab is used to enter the corresponding parameters. The full set of parameters can be saved into configuration files. The probe parameters can be saved into separate probe files. Some configuration and probe files are included with the installer. The configuration and probe files can be saved or loaded using the corresponding buttons at the top of the main window or in the probe tab (respectively). Calculations of the delays are initiated by clicking the calculations button in the toolbar. 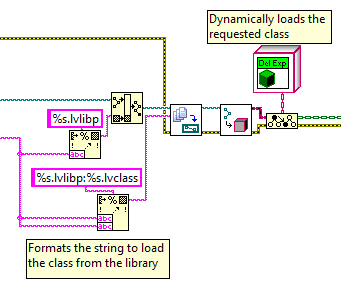 The ability of LabVIEW to use parallel processing was exploited to minimize calculation times. Rays are calculated by defining an origin point (position of pzt element) and a target point (focal point) for each pzt element. Rays are iteratively initiated from the origin point towards the target point using the Snell-Descartes law at the interface. The ray arriving the closest to the target point is selected. After the completion of the calculations, the RMS and the maximum errors are displayed in the status field at the bottom of the main window. The resulting rays are displayed in the 2D Picture, one row of elements at a time. The resulting rays can also be in an interactive 3D window, and the calculated delays can be plotted one row at a time (see below). 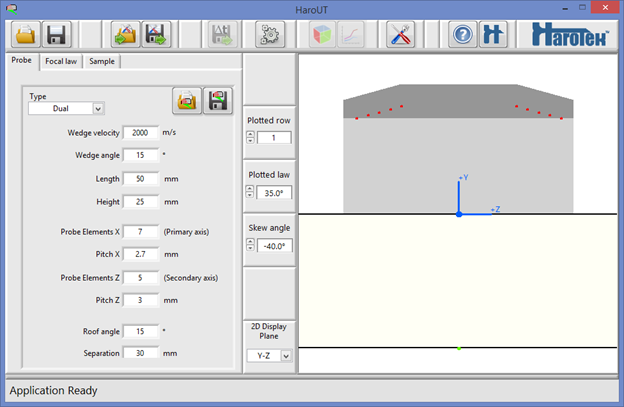 Calculated ultrasonic results can be saved and recalled within HaroUT using the Open and Save results buttons. Full configurations are also saved with the results. The ultrasonic delays can currently be exported in two formats: text and .law formats. The .law export dialog is shown below. A plug-in apprdirectory located in the <HaroUT>/PAUT Export Formats folder. A .xml file containing information about the export plugin must also be copied in the PAUT info directory locatoach (packed project libraries, lvlibp) provides the ability to add export formats without having to modify the main application. The plugins (or packed project libraries) must be copied in the Classes ed in the same folder than the Classes directory. At the time of the delay export, the plugin is loaded based on the info in the .xml file using the approach shown below. LabVIEW code to load and execute export plugins. HaroUT will hopefully be helpful for ultrasonic phase-array users. Questions, comments, and feedbacks are most welcome, especially related to testing with actual hardware. You can report bugs as comments to the current document or as a comment to the HaroUT bug report document where a list of the bugs will be maintained. If you have the chance, leave a review about HaroUT on the LabVIEW Tool Network page.